RICHMOND - More than 250 members of the wine trade, including wine critics, sommeliers, restaurateurs, chefs, retailers, winemakers and winery owners gathered at The Jefferson Hotel October 28 for the second annual Virginia Wine Summit. Hosted by Governor Bob McDonnell and First Lady Maureen McDonnell, and presented by the Virginia Wine Board and The Virginia Tourism Corporation, the event was a sell out for the second consecutive year. Wine experts and industry leaders, both domestic and international, attended the summit. They tasted Virginia wines, comparing them to vintages from California and France and discussed how to continue to move Virginia wines forward, gaining prominence within the United States and on the world stage. Internationally acclaimed British wine authority Oz Clarke gave the keynote address. One of the world's leading wine experts, Clarke has one of the finest palates of any wine writer. He has won all of the major UK and US wine writing awards, including the Glenfiddich, Andre Simon, Wine Guild, James Beard, Julia Child, World Food Media and Lanson awards. "Virginia wine has a rich and deep history, dating back to 1607," said Clarke. "But what makes Virginia wine so brilliant is what has occurred in the past 20 years. The soils and climate are completely different; no new world winemaker would have thought to start a vineyard here, except for two crusaders back in 1976: Dennis Horton and Ginanni Zonin. "When I tasted Horton's first Viognier in 1993 I sat up with a jolt; 386 years after Jamestown the Virginia wine industry, wine identity and wine future was established - the two crusaders had made the right choice. Virginia should not try to be California or France. The only way to show the brilliance of Virginia wine is to do what others can't do - Viognier, Norton, Cabernet Franc. They can't produce your wine and you shouldn't try to produce theirs." In addition to the keynote, Clarke led a comparative tasting of Cabernet Francs from Virginia and other wine regions. Dave McIntyre, wine writer for the Washington Post led a discussion on the ageability of Virginia wines, and Todd Kliman, author and Washingtonian dining editor led a session on Virginia wine and food pairings. Virginia wines fared extremely well in the comparative tastings of Cabernet Franc and Viognier. In addition, Virginia wines aged well, a testament to the quality of the wines produced. Many new and exciting wines and vintners were showcased, including varietals most people do not associate with Virginia, such as Pinot Noir, Vermentino, Petit Manseng and Hard Cider. Virginia has a distinct advantage over other wine regions because wines are not mass produced here. More talented winemakers are coaxing more out of the grapes and the soil, learning to use the terroir to its full advantage. 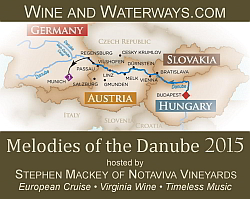 "You may look at Virginia and see sparking wine, Cabernet Franc or Viognier. I see jobs and revenue booming," said Governor McDonnell. "Wine is the fastest growing part of agriculture in Virginia, due to the hard work and no excuses attitude of the folks in the industry. In the past four years the industry has doubled in size, to 511,000 cases or 6.1 million bottles. Sales have increased 23% and sales outside of Virginia have increased 69%. As I pass this baton may the next Governor of Virginia continue to make the wine industry a priority." Wine Marketing Office’s website at www.virginiawine.org/ or call 804-344-8200. Oz Clarke leads "Francly Speaking," a comparative tasting of Cabernet Francs from Virginia vs. other wine regions at the second annual Virginia Wine Summit 10/28/13.